At the top of the world. No hint of civilisation in any direction. Extraordinary views of piled up hills, untracked rivers, wilderness. On a good day travelling the, at times, semi-knife edge Matiri Ridge, from the Wangapeka Saddle to Point 1442 near Hurricane Hut in the Matiri Valley is an exhilarating experience. Plenty of ups and downs, around 2000 m for the day, lots of bumps, including Nugget Knob, 1509 m, and views into the heart of the area well smashed up by the 1929 Murchison earthquake. It’s a tough 12 hours to do the full Stone to Hurricane Hut. Or, you can spend the night at the only real water source along the way, the tarn two-thirds along the ridge, it’s an inspiring location, well, at least if the weather is good. Entirely miserable, in fact wildly dangerous, if it’s poor. The most demanding section is at the low point of the ridge immediately to the north of Nugget Knob. That can get your heart pounding with the adjacent drop offs, but most of the route is suitable for experienced, well-equipped and fit trampers. Might mention brave and determined in the list of required personality traits. The other end of the Matiri River, ie, north of Lake Matiri is little used. The hunters tend to chopper in, so the track is entirely great, at least since it was cut by DOC in October 2015. There are a few side ventures that can extend this into a more significant trip, up to John Tait Hut/Mt Patriarch/Mt Luna through to Stone Hut. Further south there’s McConchies Hut over to Larrikin Creek Hut cross-country style via an unnamed creek and some serious bush/bluff bashing. Good weather certainly helps with this route. It’s entirely exposed along the ridge. Yeah, you need to be fit, with a head for heights for this Little Adventure. Start of Chummies Track or Rolling River carpark in the Wangapeka River valley, to the Matiri Valley carpark, via Wangapeka Saddle, the Matiri Range ridge, and Matiri River valley, with extra variations via John Tait Hut/Kiwi Saddle Hut/Luna Tops at the start in the north, and/or a day cross country, zipping up an unnamed creek to the north of McConchies Hut over to the 1000 Acre Plateau/The Haystack. 80 km one way, Chummies Track, Kiwi Saddle Hut, Luna Tops, Matiri Ridge, McConchies Hut, Larrikin Creek Hut, and out via the 1000 Acre Plateau to the Matiri Valley carpark. 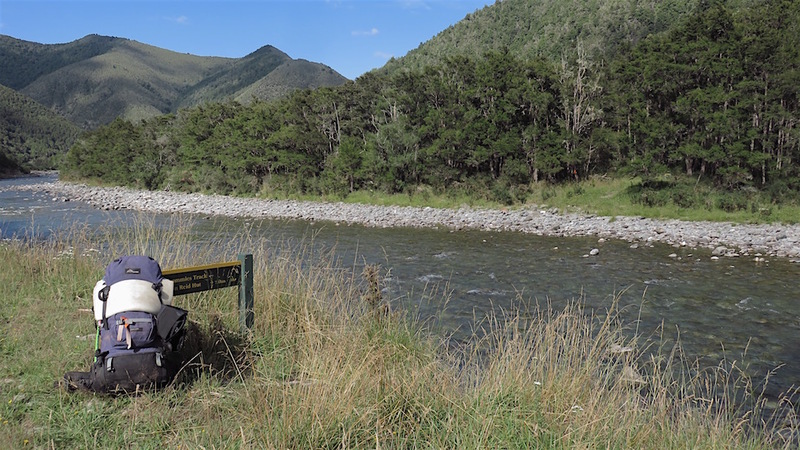 There are many variations of this route, the minimum would be the Rolling River carpark to Wangapeka Saddle via the Wangapeka Track, the Matiri Ridge and down the Matiri River valley to the carpark. 5 or 6 days via the route above. 3 days minimum. Best when there are longer and warmer days, ie, the summer months, November to April. The Matiri Ridge, undulating around 1200 — 1500 m can be snow covered in winter. This is one route where a decent map is essential. A GPS that tells you where you are is entirely useful as well. And an ELB, An Emergency Locator Beacon. Free maps can be found at Land Information New Zealand, LINZ, Topo50 maps, both digital and paper: BQ24 Tapawera, just the first few kilometres, BQ23 Wangapeka Saddle and BR23 Murchison. The DOC Matiri Ridge route website has fairly extensive information, including brief track notes from hut to hut. There are various huts depending on which route is followed. Here’s the DOC stated tramping times between huts, as shown on their website, usually actual walking times, ie, not taking into account any long breaks. While it’s possible to slash times for more popular sections, with more remote sections like these the stated time is close to the actual time in motion required. Unfortunately this time information tends to emphasise a pointless aspect of tramping, The Destination, and, some trampers feel they need to test themselves, rush, to prove something to someone. Aren’t you there to experience your environment, notice things, watch the bellbirds flitting around? There’s no actual requirement to occupy the full 10 hours a day racing through the landscape. If you can be dropped off at the Rolling River carpark, what’s the problem? The road to the Rolling River carpark road is an almost popular tourist spot, you might be able to pick up a ride from day trippers heading up Mt Owen for the day. If not its a 13 km walk down from the carpark to a busier road at Tadmor. Using public transport: it’s probably easier if you are on your own or a couple to start from the southern, ie, Murchison end. There’s an early morning, 7:15am, seven day a week Intercity bus, $36, from Nelson to Murchison but you have to get out at an obscure T junction and somehow get the 18 km up to the carpark at the start of the track. Then it’s a 3 hour walk up to Lake Matiri Hut. That’s doable in a day. Groups can get to the Matiri valley carpark using Nelson Lakes Shuttles, or Trek Express a charter minibus is $95 per person, with a minimum $380 charge, with 24 hours notice. Rolling River carpark access: groups can use Trek or Nelson Lakes Shuttles, they are now owned by the same company, might be an affordable charter $50 per person (min $200 charge). Trek have some scheduled trips to Rolling River. Murchison has a useful 4 Square supermarket that has most of the basics, open 7 days from 8:30am weekdays, 9am weekends. No real track in a remote section of the Kahurangi National Park. Yup, it’s really only for very experienced trampers. The section from Stone to Hurricane Huts, the heart of this trip, is mostly ridge travel up around 1200 to 1400 m. It is entirely exposed to the weather, the wind, rain, and/or cloud. That makes it a good weather only type trip. And not really in winter. For the fit Stone to Hurricane is a 12 hour on the move kind of day, 2000 m or so of climbing, and the same descent. It’s a humongous day. There is only the one tarn for water along the way, and that can be murky with the birds, animals and insects doing their thing. Most of the ridge, while with drop-offs one side or the other, or both on occasions, is not actually all that scrambly. The most gnarly part is on the north side of Nugget Knob. The lowest point immediately to the north requires a short hundred meter or so sidle to avoid a small bluff, but otherwise you just follow the main ridge, although to be honest, it helps to be brave. There are a couple of forest/scrub bashes just to the north of the tarn but they are both fairly short. The cross country experience up to The Haystack or 1000 Acre Plateau are more time and energy intensive than you imagine, bluffs to negotiate, vegetation to swim through or drag yourself up. Hut books indicate that Larrikin Creek Hut to Hurricane Hut via The Haystack and Point 1326 can engage some trampers for 16 hours, although 12 might be more common. McConchies to Larrikins via that unnamed creek and a couple of steep bush bashes might occupy you for 8 to 10 hours. Both of these more adventurous experiences will end up with your bark getting entirely scratched up. But if you have the experience it is entirely worth while. DOC has the Matiri Valley and 1000 Acre Plateau tramping tracks website and downloadable brochure. Here’s a 50 image slideshow from the Matiri Ridge route giving an indication of the general track conditions and sights along the way, if you need any further convincing. Images of the Matiri Ridge route huts and campsites can be found in the other Kahurangi huts section.